It’s my turn on the slide. My sister fights with me. I climb up the slide. I climb up the ladder. I am an only child, and everyone tells me this is completely normal sibling stuff. I still can’t help but think that if her only inspiration is the animosity in her home life, perhaps I should put that college fund on hold and start saving for therapy instead. Poems such as this are perfectly normal. Poems such as this could have a hundred verses. Poems such as this could fill a thousand volumes. Poems such as this were undoubtedly etched into the walls of caves during prehistoric times. Poems such as this will be written a thousand years from now on whatever people write on at that time. Ding! Ding! Let’s drop the gloves and talk sibling scraps! Posted on October 6, 2011, in Poetry, School Assignments and tagged Chase McFadden, funny kids, funny writing, Humor, Kids, Leanne Shirtliffe, poetry, Siblings fighting, Stuffkidswrite.com. Bookmark the permalink. 15 Comments. I have a sister 2 1/2 years younger than I and we fought ALL. The . TIME. whne we were growing up. But now that we are old (yes, old) we get along much better. Living 2,000 miles apart helps too because we are very different people and were we to live too close together I don’t know how it would go. 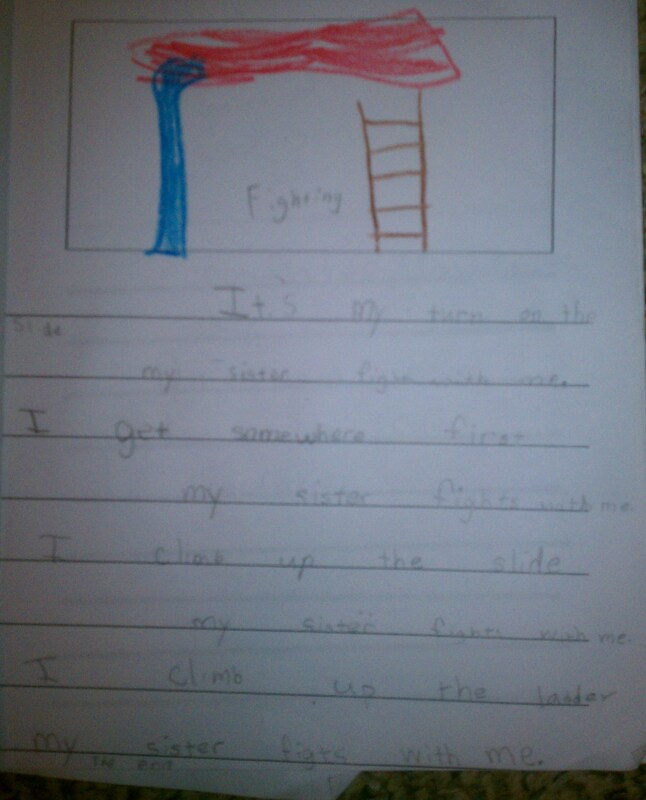 We might still write write poetry about fighting with my sister. Sometimes, distance can do wonders for relationships, right? Once again, this poem proves that kids are naturally funnier than we could ever be. They just don’t realize it. How about you and your sister, Clay? Any epic battles you recall? That’s why there are so many fights. Once a person is on that slide, she doesn’t get off. It makes sharing difficult. Once over spring break, my sister and I were home alone. My Mom had forbidden us to call her at work unless the house was on fire. My younger sister, of course, found something to call my Mom about. I was standing at the sink with my back to her and said “I hope you get in so much trouble for calling Mom at work.” She called my name and when I turned she threw the telephone receiver at me (attached to the cord….I’m that old). The receiver hit me hard right in the cheek. I ran over to her, knocked her glasses off her face, and banged her head into the microwave. Neither of us called my Mom and we each retreated to our rooms to lick our wounds. That’s what I’m talkin’ about! I love that Mom was never called. Love this! My 3-year-old said to younger girl at the playground (who was not agreeing with him) “I’m pretty sure you don’t know anything yet.” At least he added in that “yet” piece. He’s allowing her some potential… It’s to her credit that a fight was not started. “I’m pretty sure you don’t know anything yet.” My kids tell me that all the time. I’m Elizabeth. To Julie Gardner: they don’t. Not without personal injury. Haha. I’d like to see the rest of that swingset! Thanks for sharing E’s poem with us, Elizabeth. My kids fight over things like how to spell their names and whether 4 comes after 3. Because, you know, those things don’t have simple answers.